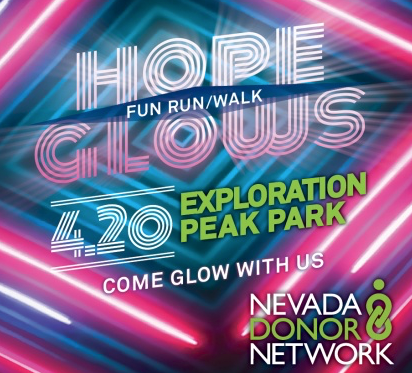 Nevada Donor Network (NDN) will host their third annual Hope Glows Fun Run/Walk in honor of Donate Life Month (April) on 4/20/19. This charity run/walk isn’t one the southern Nevada community is used to attending. The nighttime event will raise awareness and funds to support the mission of maximizing the gift of life and health through organ, eye, and tissue donation. Attendees will have a unique opportunity to “glow” in support of the almost 114,000 Americans waiting for a second chance at life, more than 600 of whom live right here in Nevada, providing a light of hope while they wait for their second chance. The event will include food trucks, games, music, vendor tables, and a grand finale firework show! It will be choreographed to music symbolizing how the gift of organ, eye and tissue donation lights up our valley and brings hope to Nevadans on the waiting list. Hundreds of supporters, including local transplant recipients, living donors, community supporters and family members of donor heroes who have given the gift of life to others, will be in attendance. Cost of entry is $25, which includes an official Hope Glows t-shirt and LED #DonateLife foam stick. The event is open to all ages and children under 13 are free. NDN will provide the opportunity for attendees to register as donor heroes on-site and representatives will be onsite to answer any questions about organ, eye, and tissue donation. Currently, 624 Nevadans are waiting for a lifesaving transplant, and a new name is added to the waiting list every 10 minutes. 22 people die every day in the U.S. because they do not receive a transplant in time. To date, more than 1.3 million Nevadans are registered as a donor.